Here's a bit of advice when considering Barack Obama second inaugural address on January 21: Don't take anything he says very seriously. “We are all Republicans, we are all Federalists.” In his first inaugural, Jefferson crafted that line to soothe the bitter rivalries of the late 1790s, when party divisions threatened to break out in civil war. But, as president, he quickly removed nearly every Federalist from office and appointed his own loyalists to take their places. Then, he and his fellow partisans nurtured a growing constituency of small farmers, craftsmen, and evangelical Protestants and made sure the opposition would never elect a president again. “We are not enemies, but friends. We must not be enemies. Though passion may have strained, it must not break our bonds of affection.” These penultimate sentences from Lincoln’s first address—which he followed with exquisite references to “the mystic chords of memory” and “the better angels of our nature”—were a valiant last attempt to convince Southern leaders to abandon their effort to split up the Union. Lincoln also promised not to “interfere” with slavery in the states where it existed and to enforce the Fugitive Slave Law, which most Northerners despised. Just a month later, Confederates fired on Fort Sumter. So much for “affection” and “angels” and, by 1863, so much for protecting slavery itself. “First of all, let me assert my firm belief that the only thing we have to fear is fear itself—nameless, unreasoning, unjustified terror which paralyzes needed efforts to convert retreat into advance.” During the nadir of the Great Depression, FDR’s claim, from his first inaugural, may have been reassuring to hear. Yet with unemployment at 25 percent, banks failing all over the nation, and trading on Wall Street suspended on that day, the dread of the citizenry was hardly irrational. His initial actions during the First Hundred Days did help stop the economic avalanche. But contrary to the speech’s attack on “unscrupulous money changers,” Roosevelt would consult with major bankers when crafting legislation to reform their industry, and his National Recovery Act empowered big corporations which, at a time of rampant deflation, could afford to raise their prices without losing most of their customers. “Let every nation know, whether it wishes us well or ill, that we shall pay any price, bear any burden, meet any hardship, support any friend, oppose any foe, in order to assure the survival and the success of liberty.” A bold pledge, Mr. Kennedy. So how did it work out in practice when you tried to overthrow Fidel Castro, prevent the building of the Berlin Wall, and defeat the Viet Cong? In retrospect, JFK’s vow may have been the most foolhardy statement he ever made. Perhaps, we should not judge the hollowness of such rhetoric too harshly. Since George Washington initiated the practice in 1789 (before a joint session of the first Congress, meeting in New York City), inaugural addresses have become staples of our civic religion and our public religiosity. They are performances which function best, as with any ritual, when they offer the comfort of tradition rather than delve into the details of policy. Nearly every president proclaims that Americans are unified in their dedication to the ideals of self-government and individual liberty. Nearly every one declares that God shares those principles and is rooting for us to apply them, from now to perpetuity. “His divine blessing,” claimed Washington, was “conspicuous in the enlarged views, the temperate consultations, and the wise measures on which the success of this Government must depend.” You can’t really go wrong with a bland pronouncement like that. If the most eloquent addresses rarely set the agenda for an administration, the forgettable ones seldom damage the president who utters them. In 1969, as thousands of angry anti-war protestors streamed along Pennsylvania Avenue, Richard Nixon gave a speech stuffed with banalities that did nothing to soften his combative image: “To lower our voices would be a simple thing…The American dream does not come to those who fall asleep…Until he has been part of a cause larger than himself, no man is truly whole.” But most of the policies he carried out in the next four years were quite popular, and he won re-election by one of the biggest margins in U.S. history. 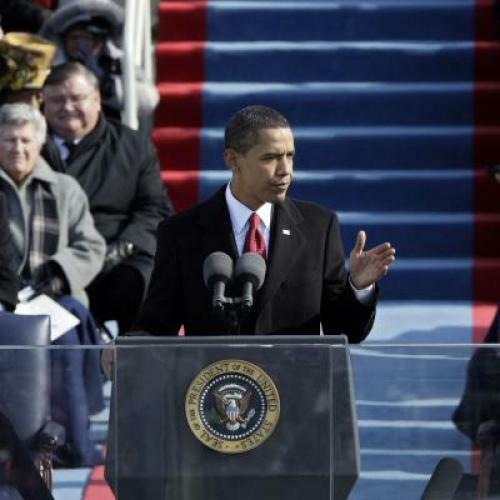 Nothing Barack Obama said in his own first inaugural address was particularly memorable, much less inspiring. On that frigid day, all that really mattered was that a charismatic black man was taking the oath of office before an enthusiastic throng of close to two million people and tens of millions more watching on screens all over the world. Neither he nor most of them imagined how brief that moment of hope would prove to be. “On this day,” Obama said, “we come to proclaim an end to the petty grievances and false promises, the recriminations and worn-out dogmas that for far too long have strangled our politics.” The line deserves to become a classic example of unintentional irony. And it fits right in to the tradition of inaugural addresses.